I was lucky enough to be able to go along to Oxygène’s Moonlight Ski last Wednesday and thoroughly enjoyed every second of it. I had done it once before in a previous season – it was during heavy snowfall so visibility was pretty bad, but it was made up for by the fact that we were getting the freshest tracks possible in new powder. I had loved it and so I jumped at the chance to go again without even checking the weather. It was only once I arrived that I realised we were in for clear skies and an actual full moon. I could hardly believe my luck and looked forward to the descent all the more. 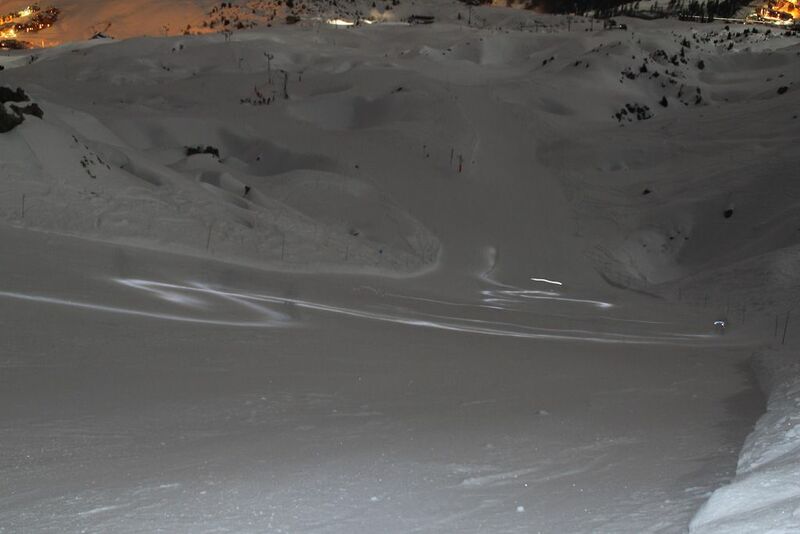 The Moonlight Ski is a real evening out and an event so much more than just a ski down in the dark. 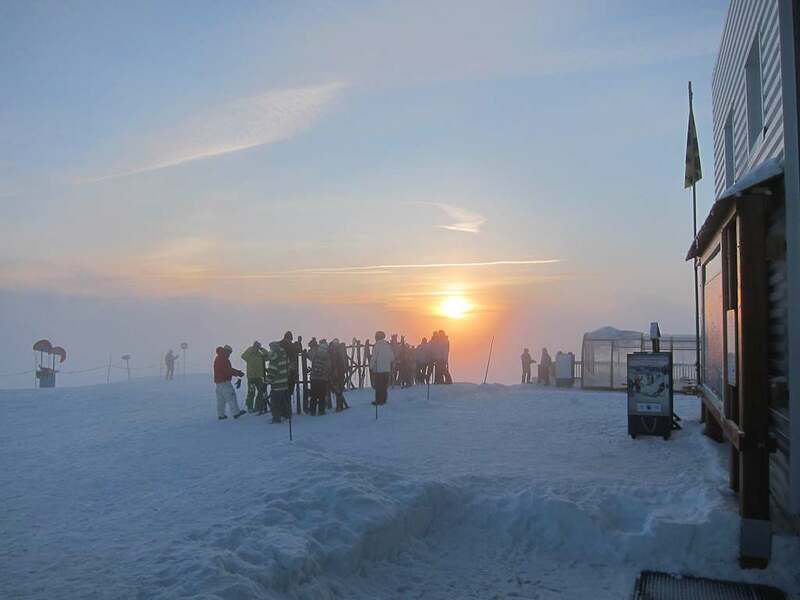 We met at the Grande Rochette bubble at 16.00 and caught the last bubble to the top at 16.15. 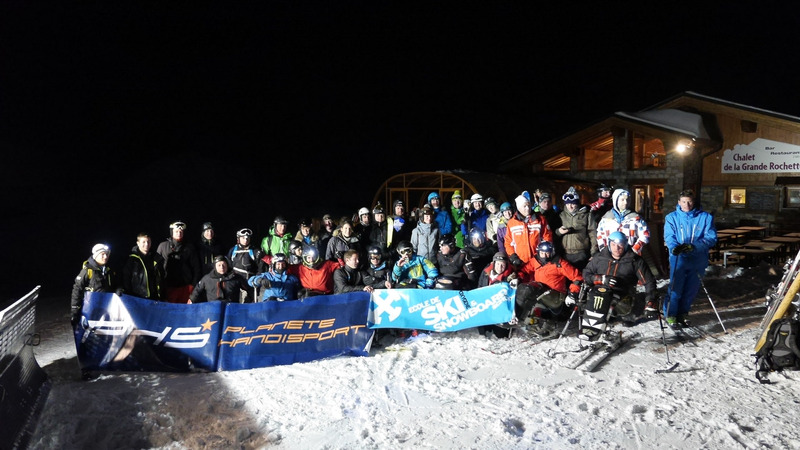 There was a good sized crowd, 46 in total including instructors, 10 sit skiers from three different associations – Planète Handisport, Handi Sport Racing and Magic Bastos. 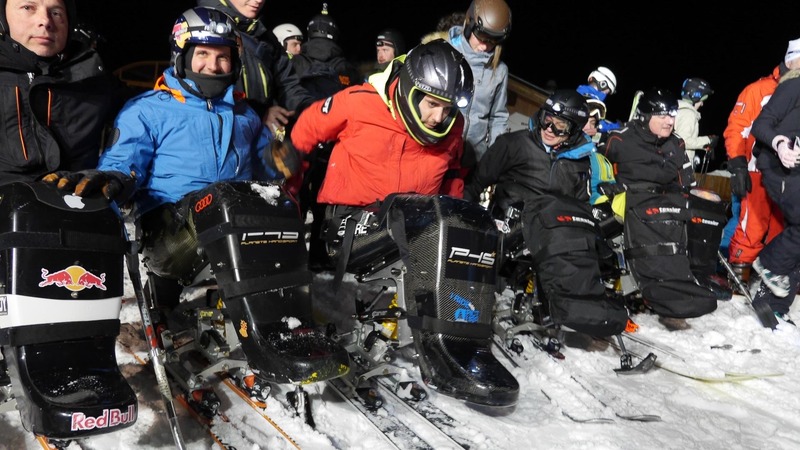 There was also 1 child and 1 non-skier in the Oxygène Taxi Ski which is a service provide at no additional cost for non-skiers, those injured or nervous/ unsure of their abilities. If you wish to take advantage of the Taxi Ski it must be requested at the time of booking as places are limited. France, Britain and Belgium were all well represented! Everyone was in good spirit as we gathered on the deck of the Chalet de la Grande Rochette, enjoying a beer and a chat as the mountain emptied around us. We watched the sun go down in a blaze of glory, which I reluctantly stopped trying to capture on camera, and just enjoyed the 360 degree view. After a brief welcome chat in the restaurant, and an explanation of events to come, we were back out in the snow getting a crash course in avalanche safety and how to correctly use a transceiver to find someone buried in the snow. It all sounded fairly simple… until we headed off to try it ourselves. It took an almighty amount of time to find the buried device. More practice was needed! It was getting pretty dark and at -10, I was starting to have trouble feeling my fingers, so we headed back inside where a log fire was burning and bubbly glasses of Prosecco were doing the rounds along with tasty canapés. I found myself sat for dinner between a lovely British couple from Devon and a couple of Oxygène instructors whose enthusiasm for the evening wasn’t in the slightest bit dampened by having experienced it before. 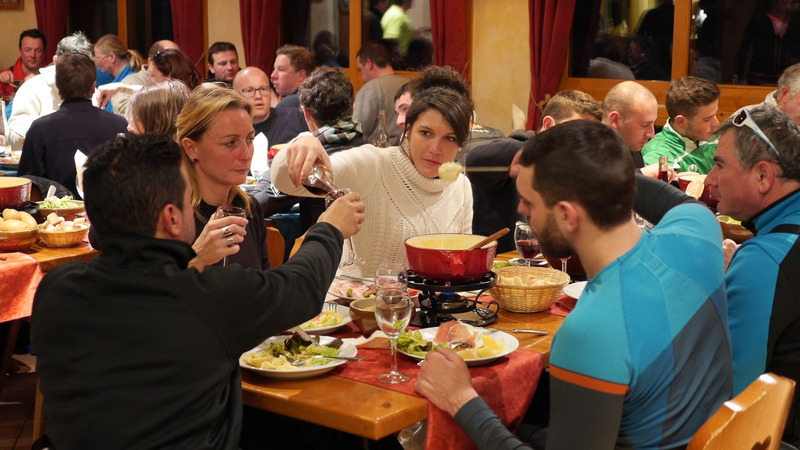 The wine flowed freely, switching from bubbly to red as the fondue pots were brought out and we all dug into the hearty fare of cheese, bread, meat and spuds. The conversation at our table wandered back and forth, never hitting a lull and the rest of the room rang with chatter and laughter as everyone got to know each other and excitedly discussed the experience ahead. Under the watchful eye of the cheerful proprietor of the restaurant the evening passed quickly with good food, good wine and good company. Then out of the kitchen he popped, proudly to display an amazing three layered lemon and berry meringue creation that was to be dessert. We were served coffee and shots of the traditional French ‘digestif’ Genepi then suddenly it was 20.30. It was time to gear up in multiple warm layers and head outside where the moon had risen, full as promised, and the mountains were washed in surprisingly bright light. You could see everything as clear as day but without the colour, it was eerie and beautiful. Laurent our instructor gave us some wise advice to leave plenty of space between each other, take our time and enjoy the experience. Taking his words to heart I headed off nice and slowly making huge slow turns and relishing the feel of freshly pisted cords under my board. The air in my face was almost balmy (though I suspect that had more to do with the red wine and Genepi than the actual temperature) and the mountain was silent, there were no sounds apart from those my board made and of the few people with me. I became fascinated by the sight of my board eating up the piste in the eerie white light of the moon and I had to physically stop and remind myself to look up at the incredible sight of the mountains by full-moonlight and the lights of the La Plagne villages twinkling away down the hill. We stopped often to soak up our surroundings and although Laurent started a spirited snowball fight it would have taken a lot to break the air of wonder and tranquility surrounding our group. We turned back to watch the sit ski group coming down behind us and could see their head torches weaving across the run. They made their way down moving at a heck of a pace as you can see from the video (although I think the guy doing it backwards was just showing off!). Then all too soon we were switching on our headlights for the final descent into Plagne Centre and arrived safely at the Croq’Neige to be greeted by very welcome glasses of vin-chaud or hot chocolate. The Moonlight Ski is something I would do over and over again, the weather and snow conditions are different each time, always amazing in different ways and I truly doubt that the experience could ever lose its wonder.